Publisher: New York: Sandpiper, 2007, 2009. Seventh-grader Holling Hoodhood is convinced his teacher hates him. His classmate, Doug Swieteck, “who once made up a list of 410 ways to get a teacher to hate you,” definitely does, and never misses an opportunity to let Holling know that. Holling’s father is difficult, making the whole family watch everything they do or say, for fear it will affect Mr. Hoodhood’s job. It’s the school year of 1967-68. The war in Vietnam is escalating. Life all around the United States is volatile and on the edge. Holling is totally on edge himself, never feeling as though he fits in, and never knowing when life is going to come crashing down on him. All that, and then at the beginning of the year he discovers that every Wednesday afternoon, half the class will be at Hebrew school and the other half at Catechism. That leaves him, just Holling, alone in the classroom with Mrs. Baker. Neither of them is pleased about the arrangement. After trying a number of things unsuccessfully, Mrs. Baker decides that on Wednesday afternoons, she and Holling will explore the world of Shakespeare. This doesn’t excite the boy at all. But over the course of the year, as disaster follows disaster in his school life and his home life, Shakespeare starts to help him make sense of things. He finds hope, and a new outlook, as he and Mrs. Baker work their way through play after play. There is hope, there is humor, there is angst, there is all that makes up a growing life in this book. I highly recommend it. For Further Enrichment: Check out the author’s website here. The website Teacher Will Run for Books has a great post about this book, with several suggested activities. Something that particularly resonated for me with this book was the time period it was set in. I was in junior high at the same time that Holling was. I recognized the events as “current events.” For kids now, they are history. To help them understand the era of the late 1960s a little better, I suggest finding the television series The Wonder Years either on DVD or Netflix, and watching some episodes together. Availability: Readily available. Check an independent bookstore such as The Red Balloon. Okay for Now by Gary D. Schmidt. This book sounds like a great read. I like to see such positive transformation in a character who really has a tough life. I was a junior in high school and would understand the current events of the late 60s. There was so much going on. Excellent review. I think you’d find this book, and its companion, “Okay for Now,” excellent reads, Pat. Yes, you’d be totally in sync with the events of the time. Thanks, Pat! I haven’t read anything by Schmidt that I didn’t like. 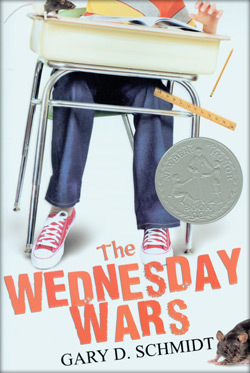 The Wednesday Wars is a terrific book, but I liked Okay for Now just a bit better. That said, I think Schmidt is the best middle-grade author out there and all his books are worth the time. Thanks for reminding me why I like his books so much. Thanks, Rosi. I believe it was you who first recommended Schmidt’s books to me, and I am very grateful. Okay for Now is an amazing book, too.